Librarians have their own holiday week. 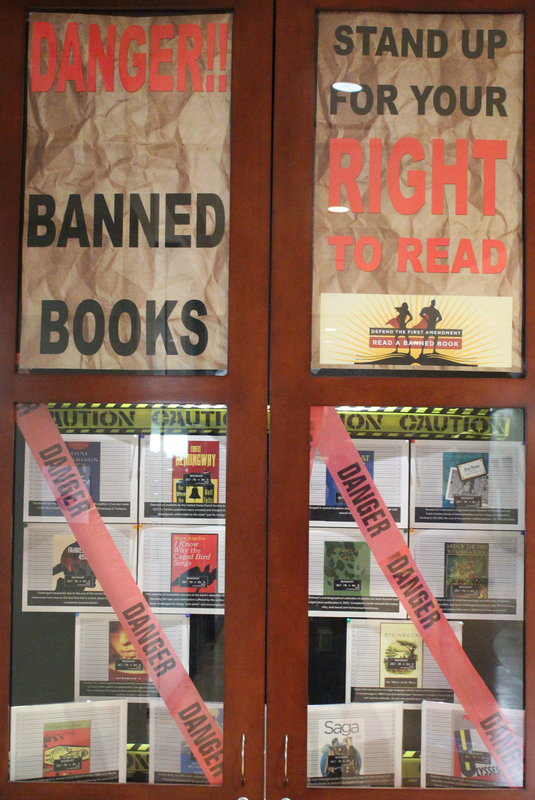 We call it Banned Books Week and this year it runs from the 24th through the 30th of September. This is a week where we look back at classics and other printed works that have been challenged and outright banned in communities around the United States and the rest of the world. We celebrate this week not because books are banned, but because despite attempts to remove books from the public arena, these questioned titles remain available for us all. This is because we are citizens of a country that enjoys the freedom of speech. Of course, when I say librarians I really mean the American Library Association (ALA) and when I say banned books I mean books that have been banned by or challenged in state sponsored institutions. And what is “challenged,” you say? According to ALA, “[a] challenge is an attempt to remove or restrict materials, based upon the objections of a person or group. 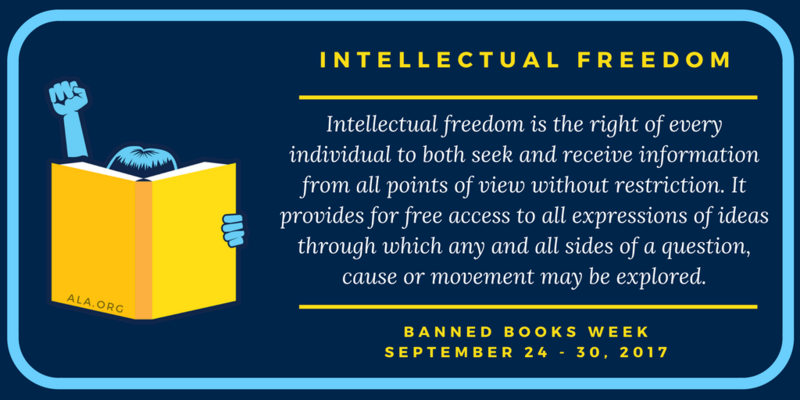 A banning is the removal of those materials.” The ALA and its partner in organizing Banned Books Week, Amnesty International, created this week to bring awareness to the masses that censorship still exists around the world and here at home as well. Motivations for banning or censoring books usually start out with a desire to do what is perceived as good. These are not the 1933 Nazi cleansings, the burning of books that challenge a political ideal. They are usually attempts to protect a segment of the population from concepts and ideals that some feel may be harmful to others. Nevertheless, an unwillingness to accept ideas outside of our personal world view is still censorship, protective nature notwithstanding. Banning books in the public domain, most often schools, leads to damage to our students according to an article called “The Effects of Censorship.” “While the attempt to keep children pure for as long as possible is admirable, it takes the form of leaving gaping holes in their education, if not academically, then about life.” The author goes on to explain that missing out on knowledge that is gained from materials some might find offensive can lead to a lack of knowledge that most feel is essential. The fear of censorship itself is also a form of censorship. Many education professors speak of the self-censorship that teachers impose on themselves. The fear of having a choice they made questioned (or getting them into trouble with the institution) leads to the avoidance of a book or topic altogether. However, one of the most important parts of education (and reading) is to study and read about both sides. First year composition courses tell students that they need to understand both sides of an argument before you can write a persuasive essay. You cannot refute an argument without understanding its underlying motivations. What we do not know, we do not know. What gaps do we all have that we are unaware of because some piece of information was denied to us? Evelyn Hall, in her 1906 Work The Friends of Voltaire, wrote, “I disapprove of what you say, but I will defend to the death your right to say it.” Basically, the standard for protected speech cannot be defined by a person’s personal beliefs. That is the attitude taken by the ALA when it comes to banning books, going so far as to quote Noam Chomsky on their web site “If we don’t believe in freedom of expression for people we despise, we don’t believe in it at all.” Book challenges don’t know political exclusivity. They come from right and left. Banned books isn’t some week designed to just speak out on the unjust persecution of books we like, it is a time for us to stand against all censorship. Just remember, if books you find offensive are banned, what’s to stop the books you approve of and enjoy from being banned? 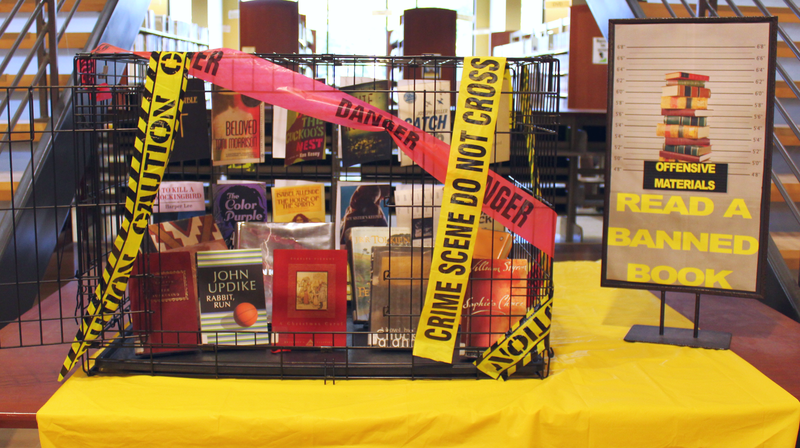 Banned Books Week is a celebration. It is revelry for the written word in which we can see our brightest heights and darkest depths, laid out before the world, to be seen, commented upon and preserved so that they may be remembered and judged by the future. And I am proud to live in a country that leaves its written testimony open and bare for all to see. P.S. – The biggest thing to look for every year at this time is the top ten list. 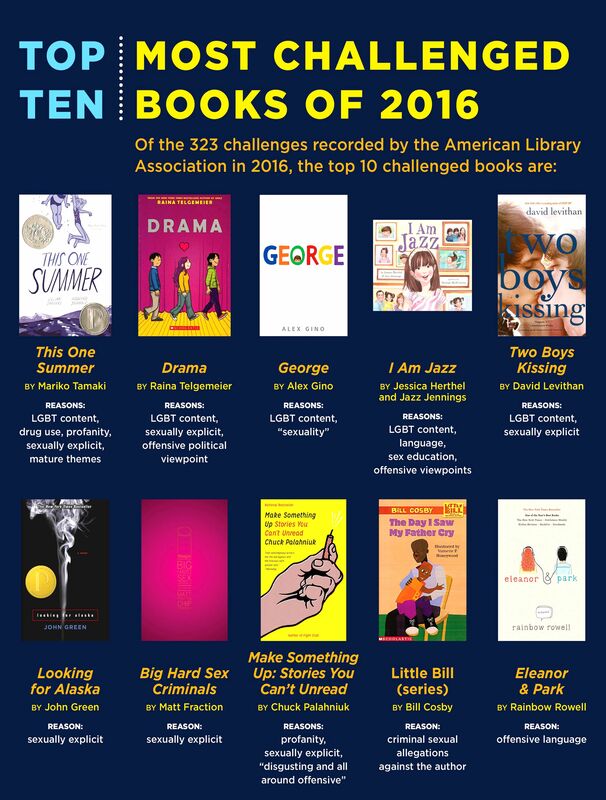 These are the most challenged books of the last year. It’s that time of year again, the time to celebrate… the freedom to READ!! Banned Books Week is Sept. 25 – Oct. 1, an annual week that highlights the importance of free and open access to information. Yeah, I know we’re also gearing up for Halloween, with fantasies of 5 candy corns, 4 chocolate kisses, 3 tiny monsters, 2 couple costumes and a big ole’ jack-o-latern… well, close enough. Is it not terrifying to think about the possibility that not only could you be told what you have to read (thank you summer and required reading), but that you could also be told what you can’t read? That may not be quite as terrifying as having dead pets come back from the grave as violent and disturbed zombies, or having a scarred psychopath with claws for fingers chase you in your dreams, but still, it’s scary. Farenheit 451 and Brave New World scary (Have you read them? They’re pretty good, and they’ve also been challenged or banned in an ironic twist). That’s why we have Banned Books Week, the annual event “brings together the entire book community – librarians, booksellers, publishers, journalists, teachers, and readers of all types – in shared support of the freedom to seek, to publish, to read, and to express ideas, even those [that] some consider unorthodox or unpopular,” according to the American Library Association (ALA). Intellectual freedom is the right of every individual to both seek and receive information from all points of view without restriction. It provides for free access to all expressions of ideas through which any and all sides of a question, cause or movement may be explored… Intellectual freedom is the basis for our democratic system. We expect our people to be self-governors. But to do so responsibly, our citizenry must be well-informed. Libraries provide the ideas and information, in a variety of formats, to allow people to inform themselves. Intellectual freedom encompasses the freedom to hold, receive and disseminate ideas. Censorship is the suppression of ideas and information that certain persons—individuals, groups or government officials—find objectionable or dangerous. It is no more complicated than someone saying, “Don’t let anyone read this book, or buy that magazine, or view that film, because I object to it! ” Censors try to use the power of the state to impose their view of what is truthful and appropriate, or offensive and objectionable, on everyone else. Censors pressure public institutions, like libraries, to suppress and remove from public access information they judge inappropriate or dangerous, so that no one else has the chance to read or view the material and make up their own minds about it. The censor wants to prejudge materials for everyone… In most instances, a censor is a sincerely concerned individual who believes that censorship can improve society, protect children, and restore what the censor sees as lost moral values. 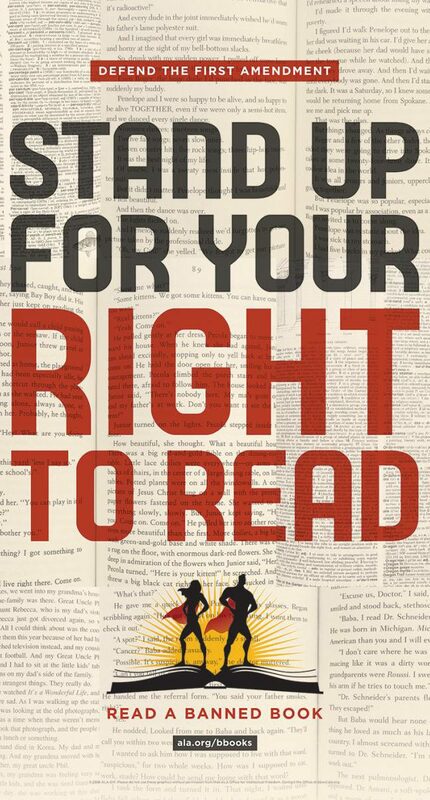 But under the First Amendment to the United States Constitution, each of us has the right to read, view, listen to, and disseminate constitutionally protected ideas, even if a censor finds those ideas offensive. In expressing their opinions and concerns, would-be censors are exercising the same rights librarians seek to protect when they confront censorship. In making their criticisms known, people who object to certain ideas are exercising the same rights as those who created and disseminated the material to which they object. Their rights to voice opinions and try to persuade others to adopt those opinions is protected only if the rights of persons to express ideas they despise are also protected. The rights of both sides must be protected, or neither will survive… Censors might sincerely believe that certain materials are so offensive, or present ideas that are so hateful and destructive to society, that they simply must not see the light of day. Others are worried that younger or weaker people will be badly influenced by bad ideas, and will do bad things as a result. Still others believe that there is a very clear distinction between ideas that are right and morally uplifting, and ideas that are wrong and morally corrupting, and wish to ensure that society has the benefit of their perception. They believe that certain individuals, certain institutions, even society itself, will be endangered if particular ideas are disseminated without restriction. What censors often don’t consider is that, if they succeed in suppressing the ideas they don’t like today, others may use that precedent to suppress the ideas they do like tomorrow.